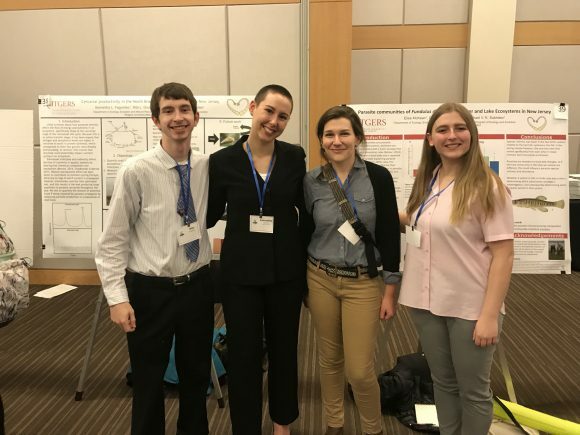 Share the post "Congratulations to SEBS Undergrad Samantha Fagundez for her First Place Finish at the Mid-Atlantic ESA conference"
Undergraduates Max Nausbaum, Samantha Fagundez, Ph.D. candidate Rita Grunberg, and undergradute Elise McKean at the Mid-Atlantic ESA Conference. Photo: Suzanne Sukhdeo. 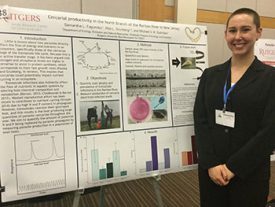 Undergraduate Samantha Fagundez’s poster presentation wins first place. A group of undergraduate students from the Department of Ecology, Evolution and Natural Resources—Samantha Fagundez, Elise McKean and Maxwell Nausbaum—presented posters on their independent research projects at the Mid-Atlantic Chapter of the Ecological Society of America Annual Meeting on April 7th at Rutgers University-Newark. These students completed their research in Michael Sukhdeo’s lab under the supervision of Ph.D. candidate Rita Grunberg. 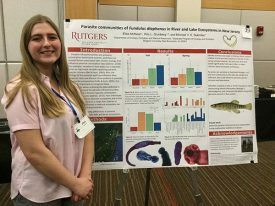 Junior Sam Fagundez presented her project “Cercarial Productivity in the North Branch of the Raritan River in New Jersey” and won first place in the undergraduate poster competition that included over 70 entries. Sam is funded by Rutgers ARESTY research program and Luis Stokes Alliance for Minority Participation. 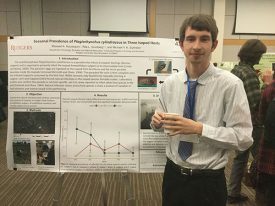 Fagundez and McKean will also be presenting their research projects at the American Society of Parasitologists meeting in Cancun, Mexico this summer.